The realm of remaking classic horror films can be an extremely dangerous place, where it's never clear whether a specific film should be respectful to the original and diligent in hitting certain familiar bulletpoints … or whether it should merely borrow the concept and create something entirely new. There's no conventional wisdom to follow there, exactly, but one could argue that those films with more identifiable stamps on them -- be it general aesthetics, notable killers, or unforgettable scenes -- will have a more difficult time in the recreation process than the ones that are iconic for their premise. That's why a wave of apprehension flooded the horror culture upon the reveal that a remake of Dario Argento's Suspiria was in the works, in which the original's visual language and musical tempo not only move in sync with the film's suspense, but often are directly responsible for it. Director Luca Guadagnino clearly grasps the reputation of the original, having crafted his own iteration that pivots on darkness, abstraction, and severity in a potently unsettling collaboration between old and new. Many of the raw narrative points have been carried over in the screenplay by David Kajganich, transporting the audience to a dance company in Berlin where an American, ex-Mennonite Susie (Dakota Johnson), has arrived for her audition. Interestingly, this version of story also takes place in the mid-‘70s, existing as a period piece that directly mentions the geopolitical turmoil going on at the time, surrounding the German Autumn. As events of the world lure certain dancers away, most stay within the confines of the Markos Dance Company's stony, fortress-like walls, honing their craft as creative instructor Madame Blanc (Tilda Swinton) figures out their next production. Other dancers, however, begin to suspect a darker secret lurking inside the company: that the people in charge are a coven of witches, using their powers to pull strings and punish the disobedient. As Susie rises quickly in prominence at Markos, the film centers on how she's impacted by the powers and threats surrounding her, as well as how the disappearances and ailments of dancers gone missing are perceived. Dancing taps into a profound, almost spiritual or mystical part of many artists, something that even the most technically proficient of performers cannot obtain, no matter how hard they try. That intangible soulful aspect fits well with the manipulations of witches: some dancers may need other-worldly forces to give them that deeper poignant connection to their craft, while others might willingly cut deals if they can get help with overcoming limitations so that their physical capabilities can match their underlying spirits. 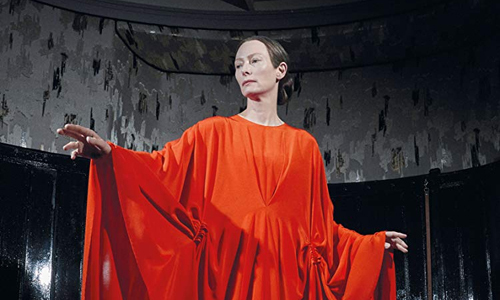 This Suspiria makes a subtle, yet noteworthy change in the German company's focus, shifting away from the upright poise of ballet to the rougher, subjective and more overtly expressive realm of contemporary dance, and that shift deepens the film's connection to the manipulations of the dancers' minds, bodies, and souls. While you shouldn't go in expecting a ton of dancing, the ways in which it's continuously involved -- almost entirely in rehearsals -- are mesmerizingly tied to the supernatural enigmas of the company itself, blending the realism of a conservatory environment with setting up an ominous horror atmosphere. From the early moments when Susie enters the cold, gray space of the studio, it's clear that this Suspiria will be wildly different in visual tone to the vivid drama of Dario Argento. This rendition reaches deep and finds distinctively hypnotic properties that in no way rely on the original's successes, conveyed through the immersive gasps of physical exertion and fluid, yet erratic camera movement that carefully swirls with the dancers one minute and them quickly zooms in on facial features the next. There's a definitive moment when the "horror" kicks into gear where these elements merge together into a fiercely gripping cause-and-effect sequence where the vagueness of the witches' coven taken hold, the shiver-inducing sound design and unflinching cinematography from Sayombhu Mukdeeprom claiming the film's first victim in a room of mirrors. There's a whispery pace leading up to this at the beginning of the film that reveals itself to be a slower-moving spell being cast upon those watching, one that abruptly jerks the audience to attention with the crackle of bones and the spilling of fluid. 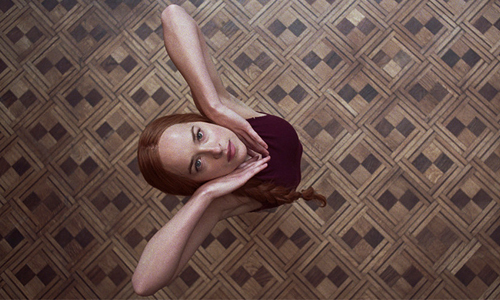 Dakota Johnson takes the lead as the protagonist in Suspiria, but calling her a horror-movie victim or prey wouldn't be accurate, and that becomes one of the central mesmerizing deviations in this remake. While this wouldn't be considered much of a character study, there's enough substance in her backstory -- involving her ailing, once-abusive mother and suppressive lifestyle -- as well as in how she adjusts to her new place among the other dancers to embrace her as a dedicated, unpredictable presence. Johnson's history with dance allows her to engage almost all the absorbing choreography (about 10%, the hard stuff, is a double), lending physical legitimacy to what's happening onscreen as her character becomes intoxicated with the recognition and what Madame Blanc and the company can achieve with her as a vessel. This take on Suspiria works on a visceral, oddly sensual level because of the nightmarish persuasion that the witches exert over the dancers: how they mess with the minds of the promising, rob the talents of some, and find ways of discarding the others when they're no longer … uh, useful. Suspiria gets caught up in unleashing those haunting sights and sounds upon the dancers, and while the audiovisual tricks remain a treat to savor throughout, Luca Guadagnino's version struggles with holding onto a steady narrative alongside those sensory provocations. Notably, there's a considerable secondary thread involving a psychiatrist, Klemperer, and his gradual discovery of the witches' coven that feels like a superfluous addendum, born of the desire to reinforce the film's truths and historical thematic interests. There's strength involved with how the doctor -- played by Tilda Swinton hidden under prosthetics -- mines the psychology of the dancers and becomes outside confirmation that things happening inside the dance studio aren't just illusions or delusions. That said, his elderly sleuthing and reflections on the disturbances of his prior life become sluggish, elongated diversions from the spellbinding horror and metaphors within and around the dance company. Despite this subplot being responsible for a cameo from Jessica Harper, the original's wide-eyed heroine, this would've been a more focused piece of work had Klemperer's role been significantly reduced. Yes, Suspiria reaches a point where it feels dragged out for too long, but the graphic, phantasmagoric endgame makes it worth having patience with Guadagnino's scattershot pursuits of symbolic and historical undertones. Those anticipating a duplication of the original's grand finale should be surprised, as David Kajganich's writing has recontextualized and deepened familiar motifs into an interpretive crimson-hued rush of chaos that conveys points on its own terms, and it's been tough to stop thinking about ‘em since seeing it unfold. The corrosive, deceptive nature of power and control result in this Suspiria discovering a truly distinctive energy far apart from its namesake, showing reverence to the premise while also bringing a contemporary edge to the tone, the horror, and the ideas floating around the dance company. Guadagnino's choice to construct something entirely new atop Dario Argento's foundation has resulted in one of the more uniquely beautiful, flawed yet thought-provoking genre films released this year, joining the annals of remakes that stick their landings with enough panache to coexist with their namesake.